This shopping plaza on West Avenue was recently purchased by 60 West Avenue LLC. As Saratoga Springs expands with businesses and homes, companies are looking outside of downtown for places to build. Developments on West Avenue are among growing areas in the city. Lookout Saratoga LLC recently purchased a strip mall at 60 West Ave. in Saratoga Springs. The plaza contains approximately 30,000 square feet of commercial space. 60 West Avenue LLC purchased the former G. Heath King furniture store within the strip mall in 2007 and renovated it into its current condition—a 30,000-square-foot shopping plaza. The new owner, Lookout Saratoga LLC, is an independent investor with some similar properties in the Capital District . The plaza sold for $4.3 million, according to real estate companies involved in the transaction. 60 West Avenue LLC was represented by JoAnn Potrzuski Cassidy and Julie Bonacio at Julie & Co Realty of Saratoga Springs. The purchaser, Lookout Saratoga, was represented by Alex Kutikov, Connor Kuhn, and Gordon Heeps of RedMark Realty in Clifton Park. “They liked the appeal of Saratoga Springs. They see it as a city that is heading in the right direction,” he added. 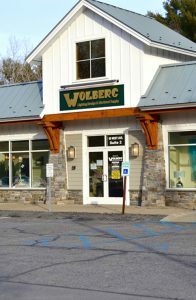 The plaza at 60 West Avenue is currently occupied by Wolberg Lighting Design and Electrical Supply, Treasures Consignment Boutique, Tark’s Indoor Golf Club and Fastenal, a business that provides companies with fasteners, tools, and supplies for manufacturing and construction. Most of the businesses that are in the retail plaza have long-term leases, so there are currently no expected changes. The need for commercial real estate is growing in the city, in the wake of the surge in the downtown area. Amy Sutton has worked as a licensed Realtor since 1984. She currently works at Roohan Realty, specializing in commercial properties in Saratoga Springs. She acknowledged the growth of downtown Saratoga—and the need for more space. “Commercial real estate in Saratoga Springs is very busy. We are so fortunate to live and work in a city that everyone wants to be in,” she said. “As our city grows, I think we need to think outside the box and consider the wants and needs of our residents,” said Sutton. RedMark Realty was founded by Kutikov and Heeps in 2011. It currently represents some of the premier developments in Saratoga County, including Market 32-anchored Shopper’s World, Hannaford-anchored Village Plaza & the Shops at Village Plaza mixed-use development in Clifton Park and a new 45-acre, mixed-use development in Malta, off Northway Exit 12, that will break ground this spring. The latter project in Malta will include retail, office, hotel and residential components. Earlier this year, RedMark also signed multiple leases at 1 Racemark Way in Malta and then sold it to Arnoff Logistics for $6.2 million for the company’s new global logistics center.